When the Taliban first started to change things in Afghanistan, people welcomed them. At the time, Fadi Nurzai and his family - father Habib, mother Zafoona, older sister Noor and young sister Mariam - were living in the United States. Fadi's father had an American PhD and spoke English, and believing he could help rebuild Afghanistan with the Taliban, he moved his family back to Kabul. But it didn't take long for the Taliban to begin suppressing the Afghan people and when they approached Habib, asking to join them, he knew it was time to leave. One night, the family finds themselves waiting for a truck that will take then across the border into Pakistan, then on to the United States. 11 year-old Fadi's job is to hold on to Mariam, now 6, and make sure she gets on the truck safely. Suddenly, there is a swarm of other people trying to get on the truck, too, and Mariam drops her precious Gulmina, an old Barbie doll wearing a bright pink burka. When she tries to retrieve it, she lets go of Fadi's hand just as Habib pulls him onto the truck, which speeds away as the Taliban chases it, leaving Mariam behind. Consumed with guilt, Fadi soon finds himself in a Fremont, CA middle school. His mother, who had been ill in Kabul, has gotten worse because of losing Mariam; to help the family out, Noor has taken a job at a McDonald's until high school starts, and Habib, despite that American PhD, is driving a cab. And there are many people in Afghanistan are looking Mariam, but so far, no luck. Fadi, who loved to take photographs with his dad in Kabul before it was banned, finds his way into a photo club and a new friend named Ahn Hong. When it is announced that there is to be a photography contest in which first prize is a photo safari and one of the places the winner can choose to go is India, it is like a dream come true for Fadi. He immediately makes plans to win, get to India, then Pakistan and find Mariam., who the family now knows has made it to Peshawar. But then, on September 11, 2001, terrorists from al-Qaeda fly two planes into the World Trade Center, and one into the Pentagon and everything suddenly changes. Now, Fadi finds himself the target of school bullies who think he is Muslim (he is actually Pukhtun) and decide he needs to pay for what was done. And pay he does. Between bullies, the Taliban, al-Qaeda and the guilt he feels about losing Mariam, Fadi knows he need to talk to someone and take responsibility for his sister before he is eaten up by guilt. He knows it the honorable thing to do, but somehow Fadi just can't talk about what happened that night in Afghanistan yet. Meanwhile, they are still looking for Mariam and Fadi desperately needs to win that photography contest so he and his father can rescue her. 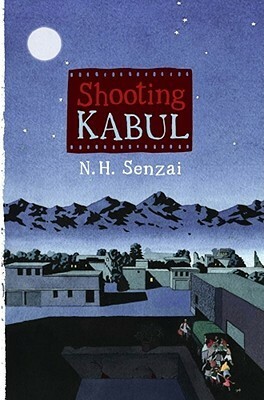 Shooting Kabul was, to say the least, a page-turner. I found Fadi to be a very likable character and thought his relationship with his father was wonderfully touching. Noor is a typical teenager who usually wants nothing to do with her brother, but still comes through for him when he needs it. In fact, the theme of family is strong throughout the story, as important as their religion is to them, and family members are very connected to each other, and that includes their very supportive extended family. The other dominate theme is racism and the spike in race-related incidents after 9/11 towards anyone who looks like they might be Muslim. Because of that, here is name calling and some violence in the novel. I thought the example of Mr. Singh, the ice-cream man who is a Sikh, being beaten up by people who assume if you wear a turban, you must be Muslim was very telling I remember riding the bus to school in the Bronx and everyday there was a man, a Sikh, on it going to work. After 9/11, I didn't see him for about a week, then he was back, black and blue and wearing a button that said he was a Sikh. I can't tell you how sad that made me. Shooting Kabul is an excellent companion book to read while studying contemporary American history since it manages to make a very complicated period of time understandable for young readers. Habib's explanation to Mariam about what is going on in Afghanistan and why they must leave requires no prior knowledge of the situation to understand what he tells her. And as the story unfolds, things become clearer for today's middle grader who might not completely understand why there is still so much animosity towards Muslims and anyone who looks like one in this country. What an intense story. Thanks for sharing at the Diverse Children's Book Linky!